– Make your own chocolate mint cocoa. Smash the stems of a few sprigs of fresh mint, and add them to the hot chocolate as it cooks. Strain before serving, and add a fresh sprig to garnish. If you don’t have fresh mint to infuse in the milk when you heat it, use a few drops of peppermint oil. You can stir your cocoa with a peppermint stick, too. – Try Robert Lambert’s fabulous Mojito Mint Chocolate Sauce on vanilla ice cream, pound cake, or straight from the jar on a spoon. For a stronger mint infusion, try the Mint Chocolate Sauce from The King’s Cupboard. – Indulge yourself with the Chocolate Mint Brownies from Solomon’s Gourmet Cookies (they’re kosher, too). Or, bake up your favorite brownie recipe and add mint oil to the batter, and/or mint chips. – Try mint chocolate chip ice cream from an artisan creamery, like Boulder Ice Cream Company or its Colorado neighbor, Spotted Dog Creamery. 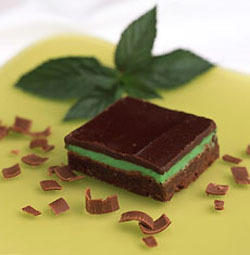 – Try the indulgent, layered Mint Symphony chocolate bar from Coco’s Chocolate Dreams. That’s dark chocolate with fudge mint shortbread and mint butter cookies and…be sure to order more than one. Or, try a straight but fabulous chocolate mint chocolate bar from Divine Chocolate, and support a great Fair Trade co-op of small cacao bean farmers in Africa. – Try the great chocolate mint cookies from Sugar Flower Bakery. You’ll never eat another Girl Scout cookie again. – Check out our favorite chocolate peppermint barks. – Go retro with Chocolate Mint Whoopie Pies from Wicked Whoopie Pies. – Bake up this recipe for a Chocolate Mint Lava Cake. – Or, bake up a ready-to-heat-and-eat Chocolate Mint Soufflé from Heavenly Soufflé, a NIBBLE Top Pick Of The Week (it’s heavenly and kosher, too). – Have a box of bonbons filled with handmade mint ganache, from John & Kira’s. – Enjoy the delicious Dark Chocolate Mint Coins from Lake Champlain Chocolates (also kosher). – Prefer your chocolate to be organic? Dagoba’s Mint 59% cacao chocolate mint bar is organic and kosher, too. – Try our favorite Holland Mints from Marich. They’re not only pretty, they’re kosher, too. – Another temptation is the chocolate mint fudge from our favorite fudge maker, John Kelly Fudge (a NIBBLE Top Pick OF The Week, and kosher). – Poco Dolce’s chocolate mint toffee squares with sea salt are the bomb. – A calorie-free option is Once Upon a Tea, the caffeine-free blend of loose tea made of rooibos tea mixed with chocolate nibs, mint and vanilla. It’s from Serendiptea. – End with a no-calorie treat, the Chocolate Mint lip balm from Ganache For Lips—made with Scharffen Berger Chocolate. Hmm, maybe it’s not so bad having these back-to-back chocolate mint celebrations. We think we’ll celebrate with a Chocolate Mint Martini. Thanks, Tom. This is just a wee bit of what we write. We have an online magazine at http://www.thenibble.com, with 10,000 archived pages of content about specialty food and food connoisseurship. Publishing the magazine sometimes gets in the way of doing the blog posts, but we try our best.